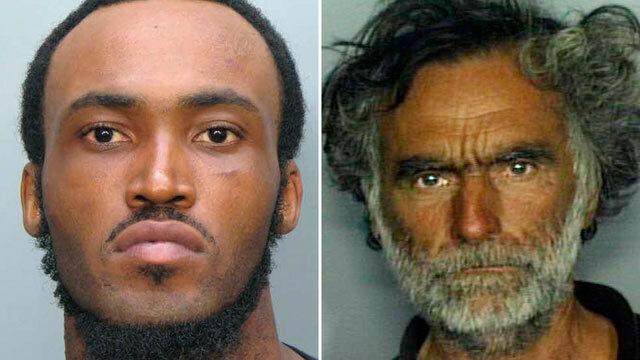 Miami police suspect that what caused a 31-year-old man to rip off his clothes and viciously gnaw on the face of another man in a daylight attack on a busy highway is a new and extremely dangerous street drug known as "bath salts." A Miami police officer shot Rudy Eugene Saturday after repeated pleas for him stop eating another man's face. His demands were met with only growls. Eugene continued, and it took four bullets to kill and finally stop him as witnesses watched in horror. According to police little remained of the victim's face, with 75 percent of it eaten away rendering him almost unrecognizable. One source says all that remained was blood and the victim's goatee. ABC News affiliate WPLG identified the victim as Ronald Poppo. Police have not officially connected Eugene's behavior to "bath salts," but experts say he was exhibiting the classic signs of someone high on the drug. Armando Aguilar, president of the Miami Fraternal Order of police, who has been in contact with the officer who killed Eugene, says the similarities between this and other recent cases involving "bath salts" are striking. "The cases are similar minus a man eating another. People taking off their clothes. People suddenly have super human strength," says Aguilar. "They become violent and they are burning up for the inside. Their organs are reaching a level that most would die. By the time police approach them they are a walking dead person." According to WPLG, the victim was a 65 year-old, apparently homeless man who was living near the causeway where the attack occurred. Eugene, who was believed to be homeless, left few clues behind as to what led to the attack. Court records show that although he was arrested several times, they were for minor offenses. His ex-wife described him as having violent tendencies, but is shocked by the attack. As investigators pour over surveillance video and continue soliciting the public's help in solving this case, many are looking to "bath salts" as the potential trigger of this vicious attack. According to Aguilar one of the recent cases in Miami involving "bath salts," which is becoming increasingly popular in the party scene, involved someone trying to bite another, but police were able to get there in time. Most have involved individuals behaving incredibly irrationally and nearly impossible to control. "There was another incident after the popular Ultra Festival where a guy was walking around naked, and was hit by a taxi. He jumped on top of the taxi, beat the people inside. It took 15 officers to stop him, and as he was being tasered, he was begging them to shoot and kill him," says Aguilar. "But because we had that many officers we were able to subdue him and take him to the hospital where they basically froze him." Dr. Paul Adams, an emergency physician at the Jackson Memorial Rider Trauma Center in Miami where the cannibal victim is being treated, says instances of virtually uncontrollable patients being brought in exhibiting signs of psychosis due to this new drug have spiked during the last year. "You can call it the new LSD. It's a recreational drug," says Adams. "They [patients] seem to be unaware of their surroundings. They are not rational, very aggressive and are stronger than they usually are. In the emergency room it usually takes four to five people to control them, and we have had a couple of people breaking out of restraints." Adams says he believes there have been at least several hundred South Florida cases alone in the last year of people coming in usually in their twenties and thirties on the drug. "We have seen people going out in pools outside of our hospital to try and cool down. They usually have to be chemically or physically restrained for six to eight hours," he said. Citing an "imminent threat to public safety" the U.S Drug Enforcement Agency banned in 2011 for a year the possession and sale of three chemicals used to make the drug as they determine how best to combat the growing problem. Although they resemble the types of salts people put in their bathtubs, the chemical make-up is different and has allowed peddlers to skirt the authorities. It can be either inhaled or snorted. It is less expensive than cocaine or ecstasy and is made in kitchens and is not that expensive. Patients on the drug can experience high body temperatures that induce hypothermia, paranoia, hallucinations, and agitation. There is no test available yet for the substance, and because the drug is so new it's unclear if it is addictive. "This is new to us. I remember years ago when I worked narcotics when crack first came out seeing people with rocks and not knowing what it was," says Aguilar. "We are facing the same problem. Aguilar said the cop who confronted and shot Eugene was traumatized by the incident. A witness was also shaken by what he said. "When I looked forward, there's a guy on top of another person, eating him and tearing him apart," said Larry Vega to WPLG who witnessed the attack while on a leisure bike ride. Vega says he went to a Miami police officer and told the officer what was going on and that there was blood everywhere. "I never thought I would see someone eating someone else. It was really, really horrific. He was tearing it up and just throwing it away," Vega said. +Man Bites Car, Bath Salts to Blame?